Tonight’s show would be my 4th time seeing Ghost live, my 3rd so far this year. Whether a headlining gig, or a shorter festival set, Ghost had yet to disappoint me with their live show. I had no doubt that tonight’s set would continue to raise the bar. 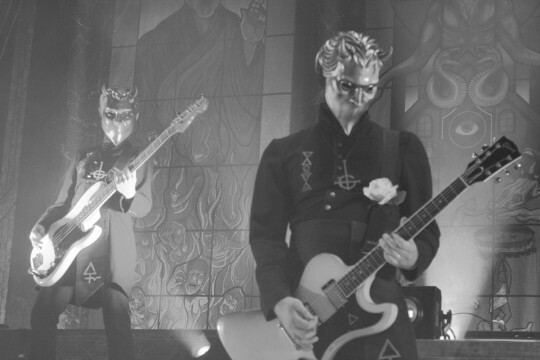 As Jocelyn Pook’s Masked Ball, used as Ghost’s introduction music, faded, the Nameless Ghouls wasted no time energizing the crowd and thundering into Square Hammer. From the moment the stage lights dimmed and the nameless ghouls walked on stage, we knew tonight’s show would be an spectacle. 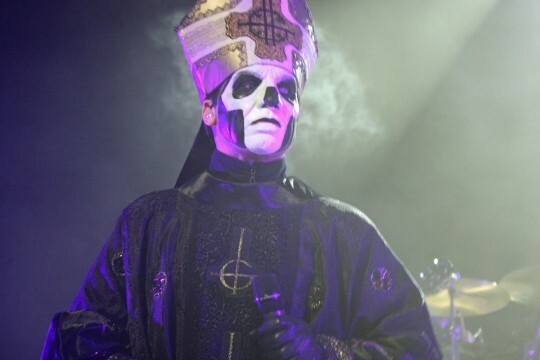 Even though several thousand fans were seated as the Nameless Ghouls walked on stage, Papa Emeritus III’s entrance was all it took for the crowd to rise to their feet. With their updated backdrop, featuring a trio of stained glass windows depicting various Biblical style works of art, the band perfectly melded their music and visual style. The band’s heavier tracks were supplemented by an astonishing light show that was heightened by the historic nature of the Paramount Theater. Tweaked for a live show, the band’s 16 song set was selected for their 3 full length releases, with the opening track being their most recent single, Square Hammer, off of their Popestar EP. Ghost’s genre and style are difficult to describe. The band has found a way to merge an aggressive, heavy sound with Papa Emeritus III’s melodic vocals. If Ghost are a harbinger of the future of the rock and metal genres, coming generations will be richly entertained. The band gave a convincing hour and a half long exhibition of innovative European style rock for a near sold out crowd. Following Square Hammer, From the Pinnacle to the Pit continued to elevate the crowd’s excitement. Our first special treat of the evening came early on in the set. The band added Secular Haze into their Popestar Tour set. Definitely a fan favorite, Secular Haze was a steady part of the band’s setlist during their opening slot on Avenged Sevenfold’s Hail to the King tour, but had not been played since the band’s 2014 tours. Papa’s crowd interaction was impeccable. 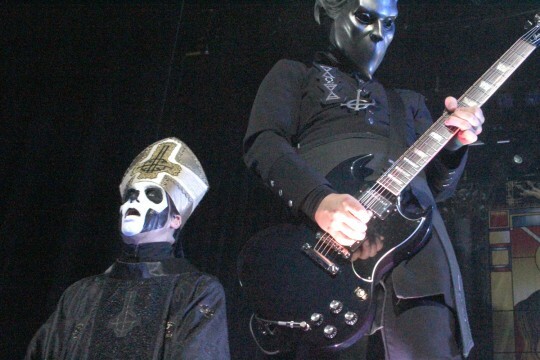 The Nameless Ghouls stalked the stage as Papa Emeritus III, dressed in his official Papal robes, enticed the crowd during the first half of the band’s set. Stand By Him bled seamlessly into Con Clavi Con Dio. It was a treat to hear a few thousand voices singing the Latin verses of Per Aspera ad Inferi. Paramount Theater’s stage was only elevated a few feet from the floor, and the VIP section of the venue covered the first full row of seats, giving the fans the opportunity to literally lean on the stage as the band performed. Papa even spoke sternly to a few of the crowd members on several occasions, reminding them to mind their place and not lean on any of the equipment. Papa then cautioned the crowd for the introduction of the Sisters of Sin. “You will now be blessed and offered communion. But be warned. You may not touch the Sisters of Sin. You can touch each other. We encourage that. But you may not touch the Sisters as they walk through and offer some of you a wafer.” It was the perfect introduction for Body and Blood. Emeritus’ costume change happened while the Ghouls played Devil Church, and gave the fans a chance to catch their collective breath. 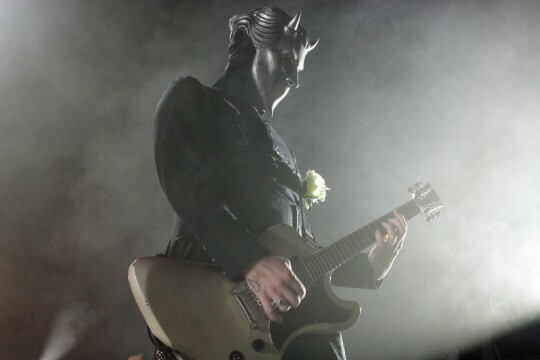 As Devil Church ended, all the Ghouls exited the stage, except for Nameless Ghoul Wind. Wind lured the crowd back as he played an extended introduction for Cirice. As excited as the crowd was, hearing the opening chords of Cirice put them over the edge. The cheers grew louder as Papa walked on stage, his papal robe replaced by his signature tailored suit. 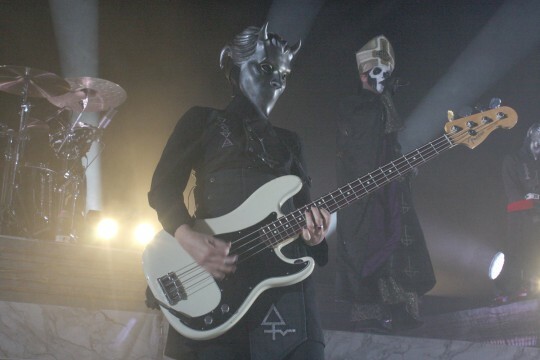 Not relying on backing tracks, or pre-programmed music, the band was able to give extensions to most of the songs played, much like the extended introduction for Cirice, and the outro for Year Zero. Having Cirice followed by Year Zero hammered the crowd’s excitement and energy to another level. As the band took a brief break, Spoksonat played as out intermission for the evening. Keeping with the surreal tone of Spoksonat and heightened by Papa’s soothing voice, He Is was performed in a similar fashion to that of a church choir; Papa leading his flock with the gently lilting hymnal. Sadly, Ghost’s set was nearing completion. Addressing the crowd again, Papa asked if we preferred the band’s heavy songs. A thunderous cacophony of cheers was the answer he was looking for. 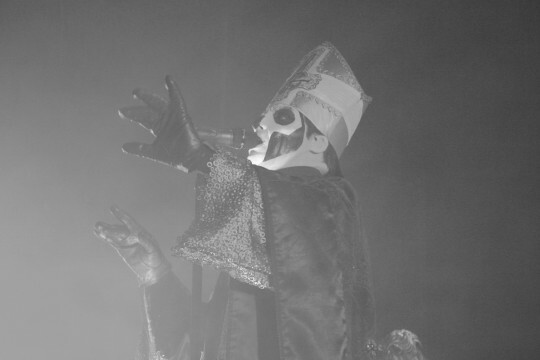 Ghost were ready to give us the absolution we craved. Absolution lead directly into Mummy Dust. Had it not been for the reserved seats, the entire theater would have been one singular mosh pit. Towards the end of Mummy Dust, as Papa walked the front of the stage and over-exaggerated jerking off onto the crowd, cannons on either side of the stage shot massive amounts of gold and silver confetti all over the theater. Mixed in with the confetti were the highly sought after Ghost bills. Mocking the U.S. paper dollar, the bills feature Papa’s face on the front of the $666 bill, and a wood carving style depiction of a Satanic ritual on the back. Fans scrambled long after the band’s set to gather as many of the bills as they could. I managed to snag several myself. As the stage lights reflected off of the confetti still lingering in the air, Ghuleh/Zombie Queen continued the night’s event, and melted in Ritual. As the Nameless Ghouls finished playing an extended outtro for Ritual, Papa Emeritus III applauded the crowd. 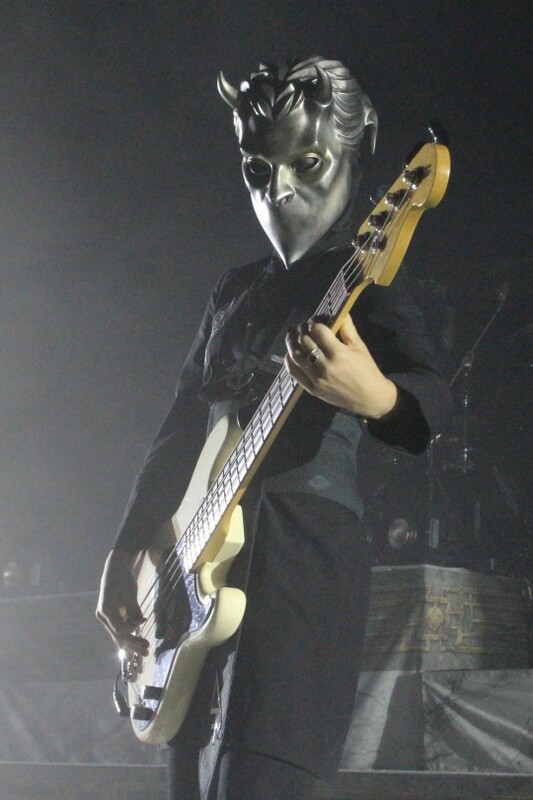 But then the Nameless Ghouls exited, Papa remained on stage. Ever the showman, Papa used his flare for the dramatic to introduce the band’s final song as the Ghouls walked back on stage. Gold and silver confetti still danced in the air as Monstrance Clock was played, and just because this was their last song didn’t mean the band would be letting up on us. For almost an hour and a half Ghost showed us what an authentic rock show is. Ghost aren’t just about the churning rage often associated with their genre of music. The band’s melodic music and flare for the dramatic fits perfectly with their ominous visuals and lustful, Satanic lyrics. With each concert, and each album released, Ghost secure their legacy. After the band had exited the stage, dozens of us made our way to the front of the theater and scavenged through the discarded confetti looking for the fan-named “Papa Bucks”. I was able to find several in great condition and about a dozen that were ripped or torn. A few dozen of us that were patient with Ghost’s schedule were lucky enough to meet the band afterwards. Not knowing who actually existed under the Nameless Ghouls masked, it was an honor for the chance to thank these musicians in person for their art. And let’s be honest, Papa Emeritus gives great hugs.